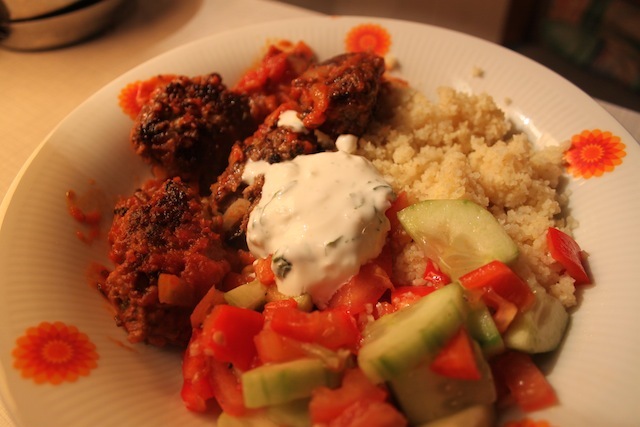 Turn Around, Bright Eyes: Bulgarian Meatballs in Tomato Sauce – Eat Me. Drink Me. 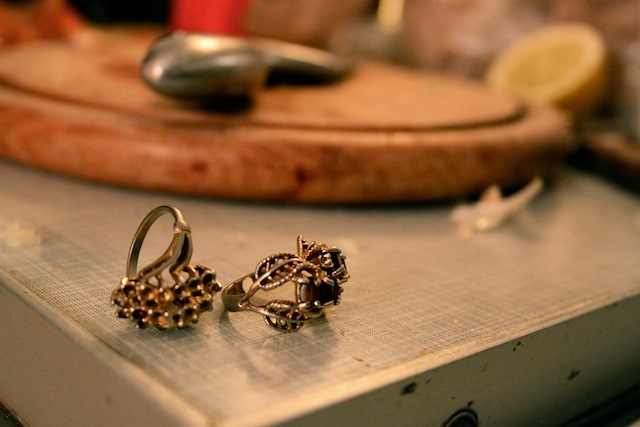 “But you have a Kochgefühl,” – a feel for the kitchen – Sylvia says to me when I tell her I don’t think I’ll ever be as good of a cook as my mother. I’ve been saying things like this a lot lately, loosing the leash of my inner Thomas. Will I ever be a great writer? Should I even be writing? Are my dreams too outlandish? Should I just settle for some mildly literary career – if I can even find a job to begin with? Am I interesting enough? Am I pretty enough? Do I blink too much? It’s exhausting, to doubt this much. I’d been speaking with a friend recently about job searching and how incredibly despondent it makes us – the longer we look, the more depressed we are, and the more despondent, depressed, and desperate we are, the less likely we’ll be to get a job. Cruel, cruel circle. What we need is a turnaround. The German word for this is Wende, a word I find incredibly beautiful. It floats, a gentle turn, like a child tucking into his shoulder as he falls asleep. I stand by this interpretation of the word, even though in a historical context, the word Wende is fraught with the political and emotional turmoil following the fall of the Berlin wall. But maybe that element isn’t too irrelevant to the metaphor I’m about to make. Because I think a Wende often begins with a sharp and incisive moment whose total import may or may not be apparent immediately. Sylvia’s comment was like an incision into the boggy doubt-world I’d been swirling around myself. Of course I can cook. Maybe I’m not as accomplished as I might be someday, but I have a feeling for food, the way ingredients fit together. I am a cook. Maybe I don’t have the accolades and collection of published pieces I’d like, but I have a feeling for words, the way they fit together. I am a writer. The best adjective for doubt is insidious. It sneaks into the way you think about yourself, what you know about who you are, and wedges the heft of this knowledge apart like kudzu creeping up the side of a house. Breaking doubt apart is difficult, much like the removal of invasive plants. Though often, when you start to pull one strand, another cluster falls away. The other night, I decided to invent a recipe, something I haven’t done in a long time. I’ve forgotten to rely on myself, my Kochgefühl to guide me in the kitchen. Sylvia had sent me home with a packet of Bulgarian seasoning, whose actual contents are unknown (lots of Bulgarian on the package, little, ahem, no English), but which is probably sharena sol (love the internet) – a blend of summer savory, thyme, basil, and lovage – along with her Wende-provoking comment. 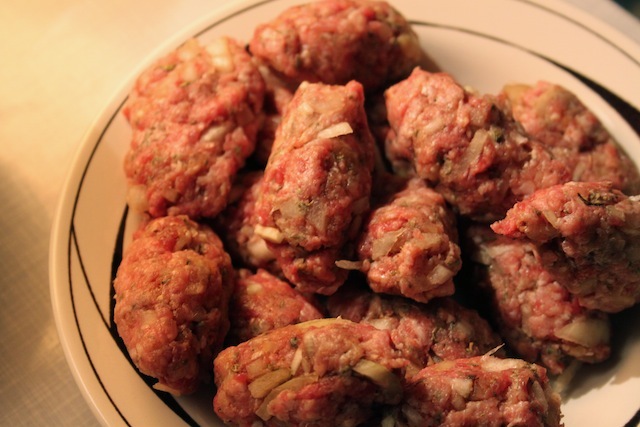 I decided to make meatballs – something not usually in my repertoire. I sat in my little kitchen, chopping onions and garlic, guessing which herbs and spices to add, improvising a tomato sauce, deciding at the last minute to make a garlicky sauce with an almost forgotten open tub of sour cream, cilantro, garlic, and lemon. As I watched this meal come together, I thought about doubt and its artificiality. Of course we have limitations. Of course we’re not flawless. But we each have unique sets of skills and capabilities defined by and defining a knowledge of who we are and what we need to be complete. What I do, I do because it is me. When we doubt, we undermine this knowledge of our selves. 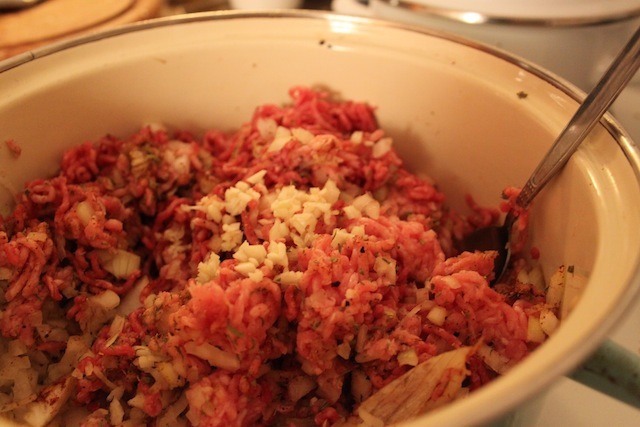 Combine ground beef and ground pork with salt, pepper, paprika, Bulgarian seasoning*, cumin, onion, and garlic. Mix thoroughly and thoughtfully and chill for 30 minutes. While meatball mixture chills, heat olive oil in a skillet. Sauté chopped onion and garlic until translucent. Add diced tomatoes and turn heat to low. Add splash of white wine, Bulgarian seasoning, cumin, sugar, salt, and pepper and simmer until flavors meld. Form meatball mixture into small patties or balls and cook over high heat in batches, with a small bit of oil in the pan to keep from sticking. When meatballs are cooked all the way through, nestle them into the tomato sauce. 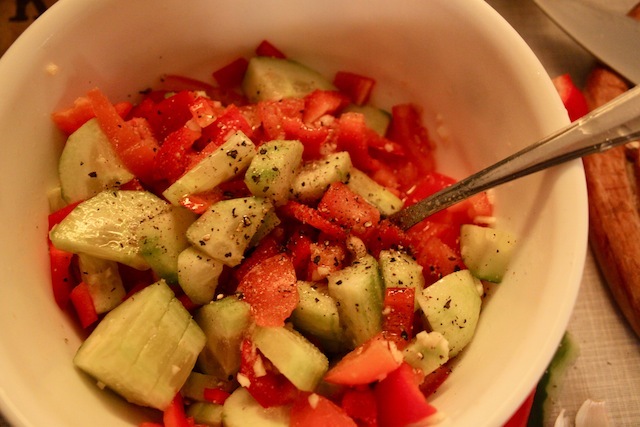 Serve over bulgur with a side of cucumber and tomato salad (cucumber, tomato, red pepper, garlic, lemon, olive oil, salt, pepper) and a sour cream, garlic, lemon, and cilantro sauce which you’ve made at some point while the meatballs are chilling in the fridge and the tomato sauce is simmering on the stove. I don’t know that I have ever “thoughtfully” mixed meatballs, but then if you are going to “nestle” them later, it’s obvious you should be thoughtful. It sounds like raising a family (except for eating them later). Do not doubt your talents for cooking and writing. Both are great, Along with your other artistic talents, you have so many that it’s hard to realize your greatest. Writing and cooking are the ones I think you love the most. It’s in your blood. Continue to pursue: you haven’t even lived a quarter of a century yet. Rome wasn’t built in a day (am I not clever to make that up?) so you shouldn’t be so hard on yourself and expect to be a well known i.e.paid writer in so few years. You “yam” and will be. I have faith.